Esoteric doesn’t even begin to describe Table Talk, a print magazine launched last week at The Schoolhouse in Brooklyn’s Bushwick neighborhood. As the first issue of Moe’s magazine points out, duende does not just mean, in the words of the Spanish poet Federico García Lorca, “the mysterious power everyone feels but no philosopher explains” when confronted by great art or performance. A duende is also a mischievous spirit. As the Boston University professor Christopher Maurer explains, such spirits played enduring havoc with the manuscripts of the man who defined duende for the modern world. 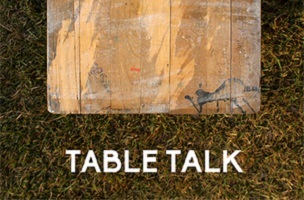 Table Talk was a front-page highlighted project on Kickstarter, which helped Moe reach his $6,500 crowd-funding goal. Issue number two of this bi-annual enterprise is scheduled for the fall.